The first thing you need to do is pick a starting point such as the steps of the pool. Using a tape measure or a rolling measuring wheel go around the pool and back to the starting point. You want to make sure you stay around 2 feet from the water line when measuring. Note: Installing the fence at least 2 feet from the water line allows enough room to clean your pool without taking down your fence and for the kids to play and have fun. In most states the barrior code requires you to install your fence at least 2 ft from the water line. Being the manufacture allows us to offer you sections of fence in various sizes. The fences come in a standard 15 foot sections on 36” pole spacing. We can also make sections in 3, 6, 9 and 12 feet. Our recommendation is that when you have the total footage that you need round it up to the nearest whole section. Here is an example of placing an order. You measured your pool and came up with 91 feet. You should order (6 ) 15 foot sections which is 90 feet, plus (1) 3 foot section for a total of 93 feet. You always want to make sure you have enough fence. Go to Home Depot or Lowes and buy a 48” STEEL RULER and 1 1/8 METAL DRILL BIT that you can put on a cordless drill. Drill a hole right on the steel ruler at the 1” mark. Then drill a hole on the 3 1/2” mark (.The two holes you just drilled is the distance for connecting the sections of fence together). Then drill another hole on the steel ruler at the 37” mark. You now have your template on 36” centers. Remember the hole you drilled on the 3 1/2 “ mark is only for your connection. This is what it should look like. There are important things to remember when laying out the job. This is a tension base fence so if you are not installing the fence in a straight line you will have to make some adjustments on your measurement. Even if you are using a template. Laying out the job will be easy to accomplish if you follow these guidelines. Remember that each section of fence will be connected together. The measurement on the connection is 2 1/2” . 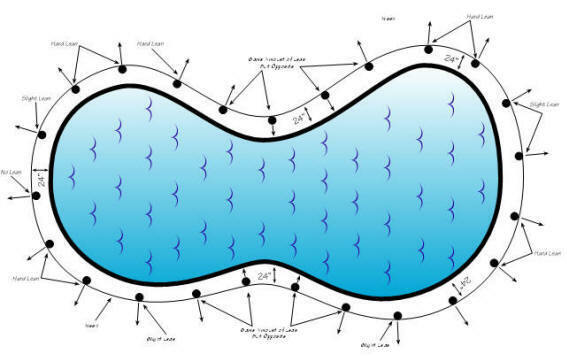 Each pool will have curves or radiuses. For the purpose of these instructions, we will refer to them as “outside” radiuses and “inside” radiuses. Here is an example layout with (2) 15ft sections connecting to and from a privacy fence in a straight line. Each will have to be understood one at a time. Remember that the mesh is on the outside of the poles so as you layout on the outside radius, you will have to layout your holes less than 36” centers, This will allow the poles to twist slightly. Since you are going around an outside turn, i.e. ; The poles must twist. So in sense, it is farther around a curve than it is in a straight line. 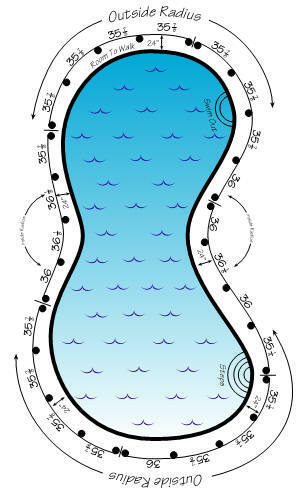 You will have to refer to the chart provided as to how less than 36” each hole on the outside turn is laid out. If the radius is sharp, you may layouts as little as 35-5/8 or 35-1/2. refer to diagram. As you can see, the inside radius is laid out further than 36” centers. Due to the severity of the radius, you will again refer to the chart. For starters, the obvious reason for the holes to be farther apart is the distance on an inside turn is less than in a straight line. Remember the mesh is on the outside poles, hence, the mesh will be loose should you drill on 36” center. The poles are twisted back inside. On an inside radius you allow a little less on the difference between holes than on the outside radius. For example, if you layout on the outside at 35-5/8”, you would allow layout at 36-1/4” on the inside radius. The reason for this difference is on the inside radius the poles do not twist as much as the outside radius. See chart. The best explanation for less on inside radius is that the pole has to twist less on the inside as to more on the outside. As you install, this will become a lot clearer to you. If you become confused just refer to the charts. Remember, the mesh is on the outside of the poles. The mesh comes in 15’ sections. Should you measure around the outside of a radius it will be longer than the straight line. The inside will be shorter. DIAGRAM A&B ARE EXAMPLE OF A LAYOUT. These measurements are approximate. As you can see from this example, all the holes are not on 36” center. For the purpose of these instructions, we will refer to curves or radiuses as inside radius or outside radius. NOTE: If you are not putting up a fence all the way around the pool your layout will start different. If you are installing the fence in a straight line from screen to screen or from your house to a wood fence, this is what you need to do. Measure 2 1/2 inches off the house, wood fence, screen or what ever structure you are hooking it up to and mark it. That will be the first hole of you measurement. 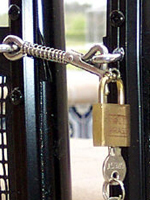 When connecting the fence to an independent structure install the hook of the latch on the fence pole. Install the eye to the structure and use an appropriate anchor. You are now done with your layout but before you start drilling you need to mark where you want your gate openings. Its very simple. You want to mark the gate holes on the inside of your fence. Each section of fence comes with 6 poles. You can put a gate opening on either end of the sectioned fence. Here is an Example of where to mark and drill a gate opening. Before you start to drill go around the whole pool and count your marks. Remember each 15 foot section has six poles. When I was installing many moons ago I forgot to check my measurements one time and accidentally drilled a seven pole section. That wasn’t pleasant. I never made that mistake again. So double check your measurements. This will teach you how to drill your holes on an angle when you are following the inside or outside radius. As you follow these simple guidelines your fence will always remain tight and without wrinkles. A loose fence is not safe. The angles will be easy to understand, and we will go over them carefully. To explain in simple terms, should you install the poles on a 90 degree hole and then pull on the pole on the opposite side, the pole will lean in that direction. Should you drill that same hole 10 degrees of of 90 degrees, this will cause the pole to resist leaning in the direction of the pull. You can visualize the pull necessary when you are going around a radius. Should you drill 90 degrees, the fence will loosen up. Should you drill a few degrees opposite the radius, when the fence is latched together the pole will be pulled up to 90 degrees and be under tension. When drilling in an inside radius you will drill the hole at a slight radius opposing the 90 degrees (see diagram). 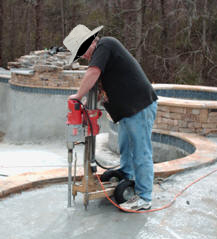 Take a look at the curve in the pool and hold a pole at an angle and you will be able to come close to the point where you will angle the drill. (Refer to the diagram). The amount of lean determined by the severity of the radius. Arrows indicate the direction of the lean: NOTE: Remember when laying out radiuses you will compensate for the radius. On the outside you layout less than 36”. On the inside you layout a little more than 36”. Should you get confuse, call me and I will help you understand. There is a easy trick to determine the amount of lean you will need when you are drilling on a angle. Stand over the marked hole you are about to drill and draw an imaginary line to the third hole. If the 2nd hole falls on the imaginary line then you drill that 2nd hole straight. If the 2nd hole falls a little to the right of the imaginary line then lean the drill a little to that side. After you get done drilling all your holes it is time to install the sleeves. Take your long needle nose and pull out all the cores you just drilled. Put the sleeve in the hole and with a rubber mallet hit the sleeve level to the ground. The sleeve should fit perfect. When you are done putting all the sleeves into the deck, go around your pool and put in all the section of fence. Now it is time to install the latches. You will notice on the end poles of each sections of fence that there is no screw in the second hole. That is where you will install the hooks and eyes (latches). Simply walk around to each end pole with your cordless drill and a 9/64 drill bit and make the hole a little bit bigger. The latches will not screw in unless you do that. After you do that simply install the hook to one end pole and the eye to the opposite pole. Squeeze the two poles together and connect it. Continue to do that until all the sections of fence is secured. When installing a self closing gate you need to start your layout with the gate. Pick where you want your gate to go. Usually that’s in front of the main stairs. Have someone hold the gate exactly where you want it. With a china pencil or marker trace around the two pegs of the gate. Double check the measurements by laying the gate down and measure the pegs with a tape measure from center to center. Then do the same to the two marked holes. When you are sure the measurements are correct go back to the two marked holes and measure 4 1/2 inches to the left from the center of the left hole and mark it. 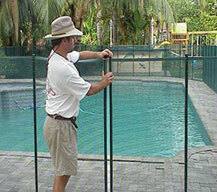 WHEN YOU ARE INSTALLING YOUR NEW SAFETYGUARD POOL FENCE AND FEEL YOU NEED HELP, PLEASE CONTACT US RIGHT AWAY . WE WILL GLADLY GUIDE YOU THRU IT OVER THE PHONE.